Bakersbeans Blog | 1 mom. 2 kids. 2 cats. 1 husband. 1 kitchen. Please be aware all content has been moved over to Bakersbeans.ca. This blog is not active. Thank you for your support and following me this amazing journey I am on. I am more than a little excited to share some news…..
…..I’d like to invite you all to check out my new website. It’s still undergoing some tweaking but going forward this is where I am posting my new recipes, and as such there will be no more posted on this blog as everything is transitioned over. Please stop by to say hello and let me know you were there so I can follow you as well! I made this recipe for the first time during a recent Mom’s/Ladies Wine Evening at my place. Our wine theme for this event was California and so I went with a healthy, bite sized salad. I’ve been to California many times and it is many things to me (special memories) so I also decided to make some Pico De Gallo & Guacamole to represent all the incredible Mexican food I’ve tasted in Southern California. 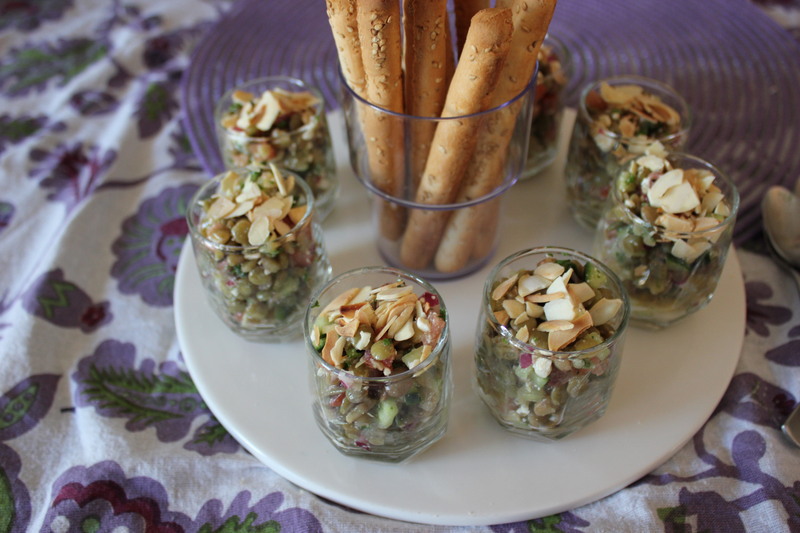 The ladies loved this Lentil Salad and so I’m sharing the recipe. Note I served this salad in shot glasses. Quite often I serve mini salad or pureed soups in shot glasses when having people over for dinner. It’s simple and it’s Fun. Bring large pot of water to a boil. Add whole garlic cloves and lentils. Reduce heat and simmer for about 20 minutes. Drain and rinse with cold water. Remove garlic cloves and continue to allow lentils to drain in colander. Whisk together oil, red wine vinegar, oregano, salt and pepper. Add lentils, feta, cucumber, onion, parsley and tomatoes stirring to combine. When ready to serve sprinkle with toasted almonds. Combine all ingredients except chicken in ziplock bag. Squishy it to mix flavours. If you find it a little on the dry side add some more oil. Add chicken, squeezing to ensure marinade permeates chicken. Let stand 30 minutes at room temp or longer in fridge to develop flavours. Remove chicken from marinade and discard. For boneless chicken breasts grill over medium heat approx 12-15 minutes or until chicken is cooked through. For bone-in chicken thighs grill over medium low heat for approximately 20-25 minutes or until cooked through. One of my girlfriend’s came to visit me last weekend. She lives in Northern BC and we’ve been friends for over 25 years. I asked her what she wanted for supper on her first night here and to make a long story short we ended up having grilled steak. No shortage of steak lovers in this family. I grew up having steak occasionally, although it would always be the same cut of steak with the same BBQ sauce cooked the same way. I swear this is part of the reason I scream for flavour and diversity in my cooking. 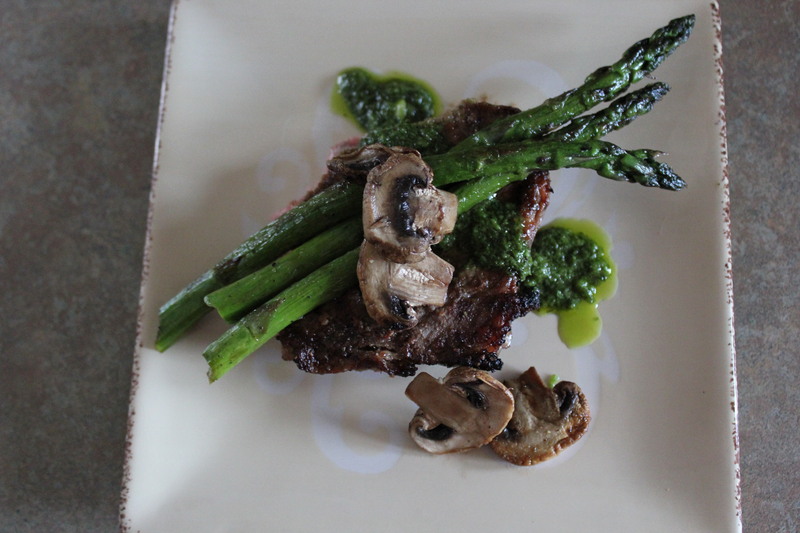 Chimichurri sauce originates from Argentina & South America. 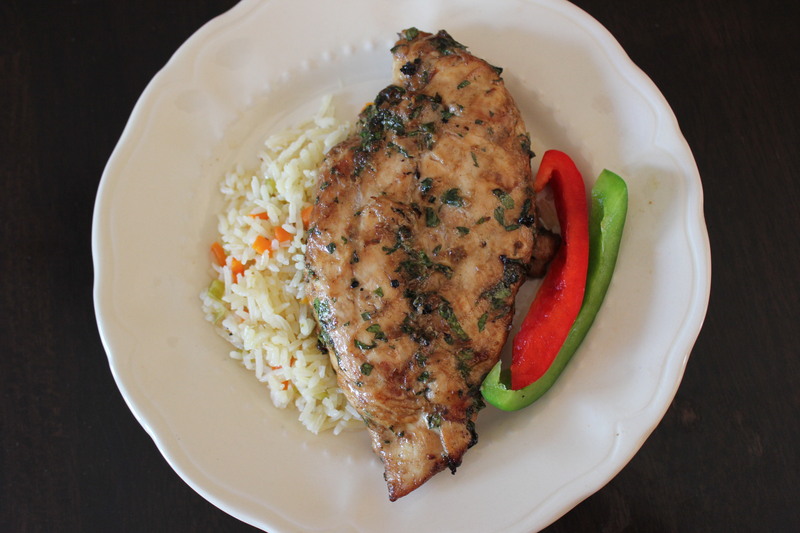 It is a lovely & tasty accompaniment to any grilled meat. We’ve enjoyed this recipe before and so it was time to enjoy it again. We grilled some asparagus & mushrooms as a side. Combine all ingredients in a plastic ziplock back and squishy to ensure steak is covered. Let marinate on counter for 30 minutes or longer in the fridge. Remove steak from bag and grill over medium heat to preferred doneness. Serve with Chimichurri sauce. Combine all ingredients in a food processor and process until smooth. Serve immediately. So impressed was I that hubby really enjoyed this salad. So much so he took it for lunch today. Now if only I could get the kidlets to enjoy quinoa since it is a complete protein and good for you. Here’s hoping one day! Add water, quinoa and salt to pot, bring to a boil. Reduce, cover and simmer until water has been absorbed and quinoa tender (about 12-15 minutes). Scoop into a bowl and set aside to cool. In a cup, or small bowl whisk together vinegar, oil, salt and pepper. 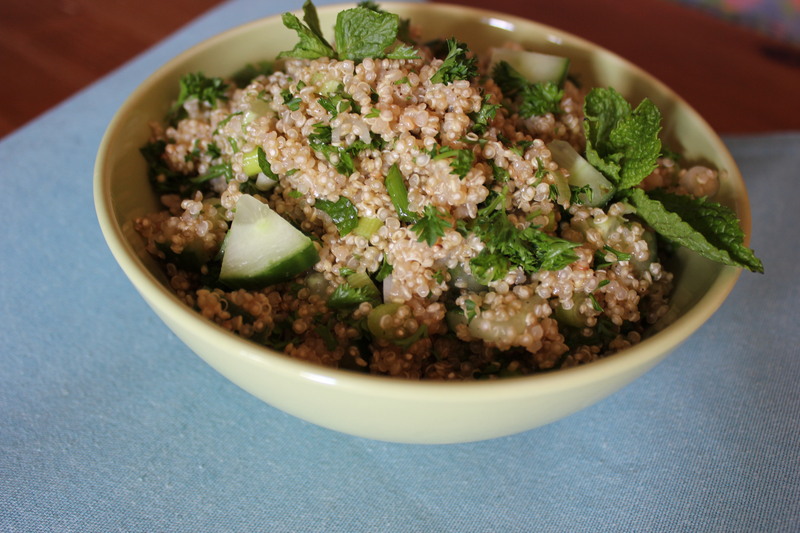 Pour it on quinoa and add cucumber, green onions, parsley & mint. Mix well. Adjust seasonings as needed. Pairs nicely with grilled meat. 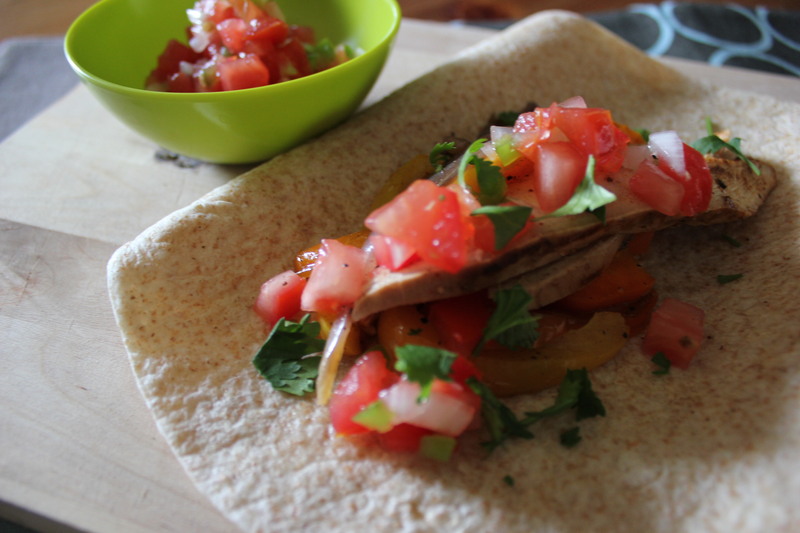 I’ve tried many different versions of chicken fajita’s and always found the flavours are rather bland. This recipe had the flavours blending nicely and everyone loving this dish. In fact my dd asked for it for lunch the next day at school (now that is unusual). In a ziplock bag combine chili powder, oregano, salt, cumin, garlic, lime juice and a little oil. Seal bag and smoosh to combine flavours. Add your chicken and smoosh a little more. Refrigerate for a minimum 15 minutes or longer if you have time. Put your onions and peppers in a bowl. Pour on a little oil and season with salt, pepper and a little cumin. Take chicken out of marinade and drain. Put on greased BBQ and grill approximately 6-7 minutes per side on med-high until cooked through and juices run clear. Remove from heat and let rest under cover. Meanwhile on a pre heated BBQ grill topper or stove top grill pan add some oil and your onion/pepper mix. Give it a little more s&p and saute for about 4-5 minutes or under veggies tender crisp. Set aside in a bowl. Get all your fixin’s ready, heat up your flour tortillas (10 seconds in microwave), slice your chicken, grab some peppers/onions and you are ready to assemble your chicken fajita.